Godfrey | 1001 Movies…Before I Die! When talking about films of the Hollywood studio system from the 30’s and 40’s, one of the first genres that comes to a lot of people’s mind is the screwball comedy. These zany, farcical, films are usually the farthest thing from realism, with characters so far-fetched and ridiculous that they couldn’t possibly be real. One prime example of the screwball comedy, and not-coincidentally the only example I had seen up until recently, was the much-loved Bringing Up Baby, starring Katherine Hepburn and Cary Grant. I didn’t like Bringing Up Baby, point in fact, I hated it. And it, being the most prominent example of the screwball comedy, led me to the mistaken impression that I just didn’t like the genre. Recently, I learned something. Upon my viewing of the fantastically fun My Man Godfrey, I learned that I was wrong. Godfrey follows the rise, and the adventures, or rather the mis-adventures, of the titular Godfrey and the spoiled, nearly detestable members of the Bullock family. Starting out in the city dump, where Godfrey is living, the flakey and fickle Irene Bullock hires him on as the family’s butler after he is claimed in a scavenger hunt as a “forgotten man”. The real conflict comes into play when Gail Patrick playing the fantastically poisonous Cornelia Bullock, sister to Irene, sets her mind on ruining Godfrey, and having him fired based on a small slight she received from him during the aforementioned scavenger hunt. Godfrey, played with ease and charm by the wonderful William Powell, handles both Irene’s romantic advances, as well as Cornelia’s maliciousness with a calm, cool head. As time passes, Godfrey becomes a trusted and valued member of the Bullock household, but he has no intention of remaining indentured to them for the rest of his life. Godfrey has other plans, and as these start to become clear, everyone in the Bullock family starts to wonder what they will do without him, even Cornelia. The real strength of this film lies in its actors performances. The story is a fine outline, but doesn’t go much beyond the blueprint stage, and the cinematography is fine, but nothing groundbreaking or outstanding. Powell, Patrick and Carole Lombard as Irene Bullock have a kinetic chemistry with one another that could carry any story pretty far, no matter how good or bad it was. Powell had already made a name for himself as one of the caustic, lovable, alcoholic main characters of the beloved Thin Man series, and My Man Godfrey only helped to catapult him into further great roles (a lot of them in the Thin Man series). Lombard and Patrick on the other hand are both new to me, but I’m definitely interested in seeing other examples of each (especially Patrick). So…what have we learned here today? Well, I’ve learned not to base my opinion of an entire genre on one crappy movie (sorry to those of you who like Bringing Up Baby). I’ve also learned that all I have to do to make it in this world, is to move down to my city’s dump, wait to get caught up in some socialite scavenger hunt, go to work for them as a butler, and ride the gravy train on to success and good fortune. 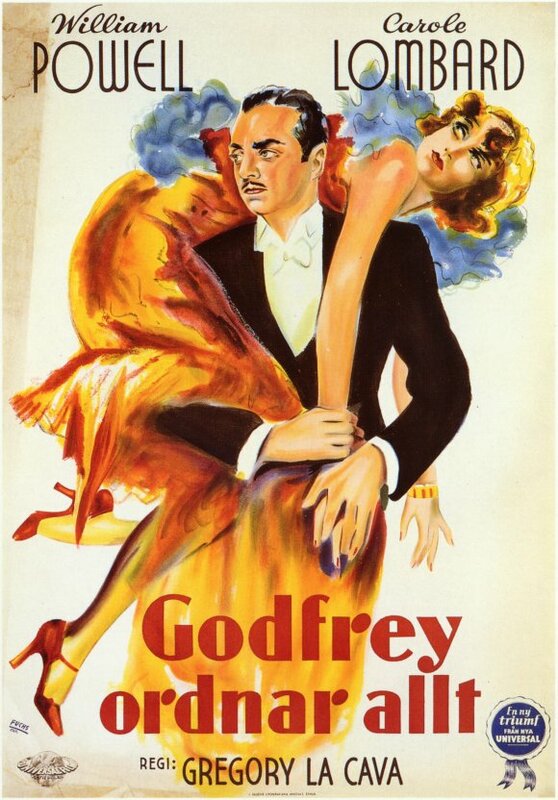 My Man Godfrey was a lot of fun, and is definitely worth checking out. I recommend it highly!